- Picked one up from newegg for $30 after $10 MIR. - Sure it basically duplicates the functionality of a sata to usb cable but puts it into a very convenient package. 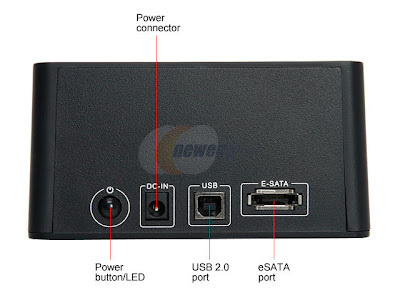 You hook this up to your pc either via USB or eSata. Then, you can quickly and easily swap any SATA hard drive (2.5" or 3.5"). - I like how there are two sets of flaps to keep the dust out. The smaller cut out is for 2.5" laptop hard drives. - The only sata hard drive I had sitting around to use for testing at the time was a 320gb 5400 rpm 2.5" laptop hard drive. - first I tried it over usb. Hooking it up vista 32bit installed the usual drivers which are already built into the OS pretty much like any sata to usb cable or external enclosure. Next, I dropped the hard drive in much like inserting an Atari 2600 cartridge (am I dating myself?). Then, reach around back and turn on the power. After a few seconds for the drive to power and spin up it shows up just fine with a drive letter. HD tach shows around 15.4 MB/s which is about right for usb 2.0. - To remove the drive first make sure you go to your tray and safely remove the drive. I highly recommend USB Safely Remove which adds a wealth of features like making sure a device always gets the same drive letter, adding hot keys for quickly removing a device, and showing what is preventing you from removing a device and releasing those locks. It's well worth the $14. Next, power off the dock, wait a few seconds to let the hdd spin down, and then press the handy eject button that pops the drive out. - First, configure the jumpers to determine which 2 out of the 4 ports you want active. I wanted the two external ones so that required moving all the jumpers. The manual included in the box was a bit confusing. Make sure you download the pdf manual from here which has photos that make it much clearer on how to set the jumpers. - Here are few tips that I got from reading the newegg reviews. If the IC chip reads EN29LV040A (which mine did) then you need the updated firmware and flasher which is NOT on rosewill's support site. Newegg reviewer theholmboy was nice enough to post it here which will save you the trouble of emailing support for the files. So boot to pure dos, rename the bin file to something that conforms to 8.3 format (I just renamed it to up.bin) as the flasher doesn't support long file names. Then type jm36xupd.exe /w up.bin. It shows a menu with two items (1 - raid something, 2 - mass storage something). I just picked 1 and it flashed just fine in just a few seconds. After a reboot you should see the version number for the jmicron bios go up. Just go to device manager find the controller, update driver, browse, and point to the floppy32 directory. After another reboot you are set. - I did several tests with hot swapping the hdd without issue. 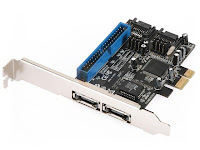 Since you are bypassing the bridge chip entirely and going straight to sata transfer rates are the same as if you installed the drive internally. HD Tach reported 51.2 MB/s. I expect around 100 MB/s with a modern 7200 rpm desktop drive. My 1.5 TB seagates should be in tomorrow. - UPDATE: got my 1.5 TB seagates in. They are all firmware CC1H which is the latest. hd tach reported 102.1 MB/s, 16ms. - So this is how I plan to use all of this. I'm planning to use hard drives for cheap, quick, and convenient long term archive storage. Lets first do some cost analysis. 320 DVD's cost around $110 so you pay about $20 premium by going HDD for each 1.5TB of storage purchased. So it costs 3-4X more to store the same amount of data on BD-R vs HDD. $1.2488 / 8.5GB = $.147 per GB!! Note: all size calculations I used the published GB (not GiB). I also don't take into account differences in file system overhead like UDF or NTFS. - Blank DVD media prices have been about constant for the last year. I see HDD $/GB to continue to drop as densities increase. - You also save a lot of physical space since the dvd binders do take up a lot of shelf space. - By not leaving the HDD plugged in all the time like in an external enclosure and instead putting it back in the anti static bag and shelving it, you reduce risks from power surges and such. - The other issue with hard drives that are left on a shelf is magnetic decay and stiction. I have a friend how has worked in storage for many years. He asked the storage expert on their team about this. He said basically stiction is a non issue these days with fluid bearings. He also felt magnetic decay was mostly a non issue, and the data should be fine for at least 10-15 years even though hard drive manufacturers are weary to claim those numbers (probably due to liability exposure). I've also seen this linked from several places. Believe what you want but I'm going to trust my friend. Having said that I will still burn a copy of critical data like family photos on dvd's. Redundancy is still the best insurance policy. I'll let you know for sure in about 10-15 years. - Another thing to consider is will SATA still be used in 10-15yrs? You will still need a way to read the data off the hard drives for the foreseeable future. - You might not fill up an entire DVD so there could be some wasted space so you won't obtain 100% efficiency. That might impact the pricing numbers a bit. Highly Recommended. 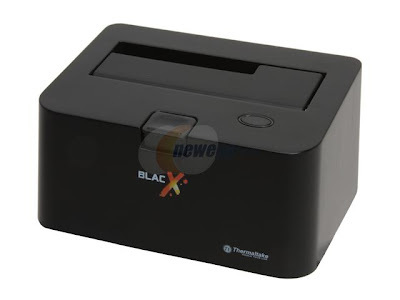 BlacX makes HDD as an archive medium feasible, extremely fast (over esata), and convenient. It will only get more economical. - I'm having some odd issues so I've went back to the latest rosewill drivers v1.1. I'm still doing more testing but it works for the most part. I have 3 copies of all my data. Main hard-drive, time machine HD daily backup, and monthly external HD backup. Yeah I have an external HDD that is on 24/7 that I do automated monthly and daily backups for all my running sysems. This device I'm going to be using for archiving which is data I want to store for a long time but don't need it "online" all the time. I think Rosewill maintains a full line of computer products such as cooling fans and computer cases. It is a house label of Newegg.com. what is the﻿ necessary of the docking station?